If you are asking yourself the question, should I advertise on my blog? – what is the value and will it compromise my brand? then read further for additional insight into this present-tense conundrum thousands face daily. Should You Advertise on Your Website? Despite the taboo like pretentiousness and the past prejudice business owners blatantly assumed in consideration to advertising on their websites, in the face of opportunity, many online properties are monetizing their traffic with alternate revenue streams such as affiliate marketing and advertising. Depending on your core business model, the popularity of your niche or market, post frequency of content, the type and depth of content and whether or not you have a sales funnel and monetization model, advertising is one way to recuperate an ROI for all the time you invest into blogging. I have said in the past that “SEO is only one type of traffic”, and there are two ways to convert visitors into customers. The first is intentional, through presumptive positioning in the search engine result pages through targeted keywords and key phrases using SEO or SEM. The other method is through mastering how and where your brand appears through using other sympathetic web properties to entice tangential traffic (where people swing from link to link or rather site to site on a whim until they land on your pages). Your website represents an opportunity to act as that vine to others or be a destination based on what they need at the time and what your online property has to offer. The connection that ensues can either result in the conversion for your website or conversion for an affiliate, depending on how you manage your upstream and downstream traffic. Who would have thought that search engines would turn into rich-media billboards for the highest bidder? 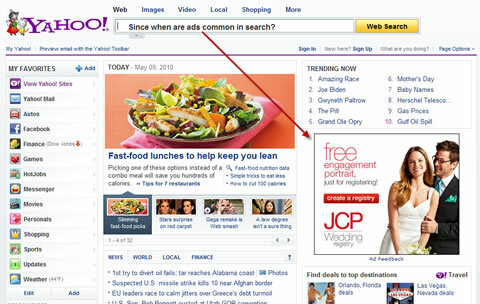 Much to my surprise while using Yahoo yesterday, I could not help but notice their new format for display ads above the fold on the top right portion of the page. This is one clear example of one of the oldest sites online that currently enjoys hub status as a web portal that finally decided to make money through tangential traffic as people spin-out or rather, “surf” the web. There is a clear and decisive benefit to strategic alignment with web properties that are conducive and sympathetic to your subject matter. Just look at the recent unique visitor trends per month as tracked by compete.com for Google, Yahoo, and Bing and what percentage of increases in traffic they are engaging as a result of overlap for top referrals and top destinations. If you have a potential audience that could benefit from the type of visitors your website receives, then experimenting with advertisements to offset overhead costs and generating an additional revenue stream is something which you should investigate. Since our expertise is focused mainly on SEO, which is only one piece of the online marketing pie, by far one of the most complete and all-embracing guides I have ever found on advertising and monetizing your website is a smashing post by Daniel Scocco from Dailyblogtips.com with his stellar post called 28 ways to make money with your website. It’s not really a matter of should you advertise, but more a matter of how you advertise? It’s not just that everybody is doing it, it boils down to two things (1) traffic is fluid and (2) visitors are eventually going to leave your website anyway. The key is to leverage this simple fact and use it as a means to introduce potential sales funnels like a door prize as visitors leave. Gargantuan entities such as Google understand this premise and have monetized it based on the fact that they know the value of function eclipse and transcend the temporary impulses of search behavior. The simplistic “what’s in it for me” action/reward modality that is enough to fuel a multi-billion dollar empire from the webs most trafficked properties can also represent a great opportunity as an asset for your online property. Being a traffic broker that can benefit from people coming and going without having to sell anything yourself is a great monetization model. By using that model as a benchmark, you can (a) determine which potential upstream sites could benefit from your visitors, reach out through determining which affiliate programs exist and how you can introduce a funnel or (b) where you can send downstream traffic by way of advertisements or sponsors. The possibilities are limitless in scope and only fixed based on your effort to generate a buzz, find the appropriate audience and give them something worth reading. The rest is history as long as your message is aligned to your sales funnels and your support system sympathetic to the visitors original intent. 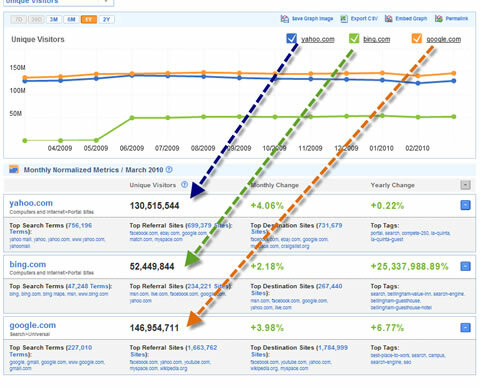 Previous Article Website Traffic Or Conversion: Which Matters More? Next Article Who Said Search Engine Optimization Was Easy?